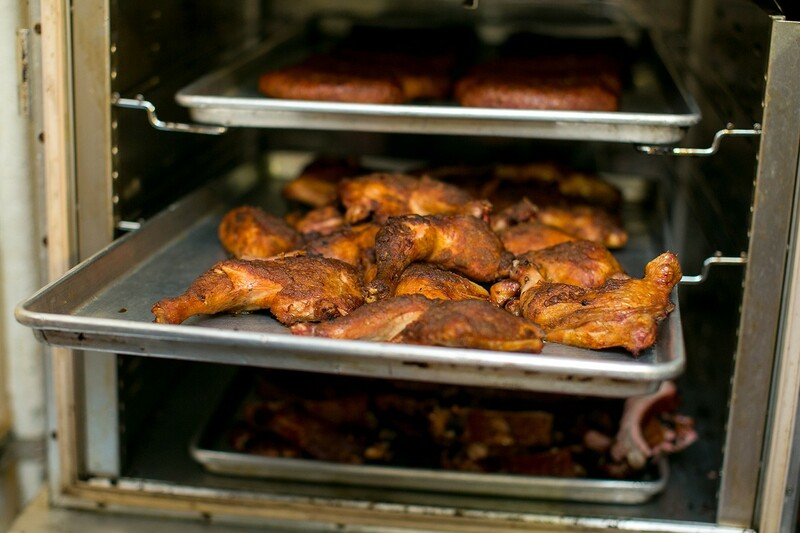 BBQ Hut's lovingly slow-smoked meat sets it apart from its East Bay peers. Hours: Tue.–Sat. noon–8 p.m., Sun. 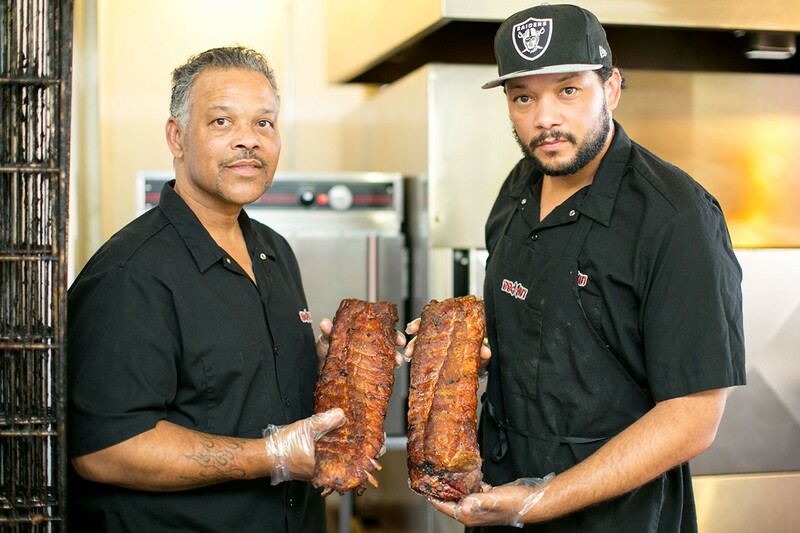 noon–5 p.m.
Earl "Lucky" Moffett, the proprietor of the newish North Oakland barbecue joint BBQ Hut, grew up in Oakland Hills, but his father raised him like a real Southerner — with ducks and rabbits in his backyard, and a catfish pond. Moffett said his father, a native of Pittsburg, Mississippi, taught him from an early age never to get too attached to the animals: They were all destined to become dinner someday. These days, Earl — along with his son, Chris — are honoring his dad, who made better Southern-style barbecue than anyone else Earl knew, by cooking his recipes at the restaurant they opened this past February. Make no mistake, BBQ Hut isn't anyone's idea of a fancypants barbecue joint. The decidedly no-frills restaurant occupies a tiny, aptly hut-like storefront — a former liquor store located just south of the Berkeley border. The big "BBQ Hut" sign marks the restaurant as a "Drive-In," which just means that there's a small parking lot. The menu is limited to four kinds of meat — baby back ribs, brisket, chicken, and links (hot and mild). Side dishes, which come in miniscule plastic tubs, aren't particularly memorable: syrupy-sweet baked beans, a mustardy "Creole salad" that's like a cross between an egg salad and a mashed-up potato salad, and standard-issue stewed collard greens, notable only for having a decent amount of heat. Those looking for California-style reinterpretations of Southern vegetable cookery have come to the wrong place. Likewise the beer taps stick to tried-and-true, mainstream favorites — such as Drake's, Sierra Nevada, and Shock Top. If you really want to keep it simple, there are bottles of PBR in the fridge. Let me speak plainly: Don't come here to geek out over anything other than the meat. It's in the particulars of the meat — all of it lovingly slow-smoked with a simple dry rub — that BBQ Hut sets itself apart from its East Bay peers. Start with the pork ribs, the menu item Moffett said he's most proud of. 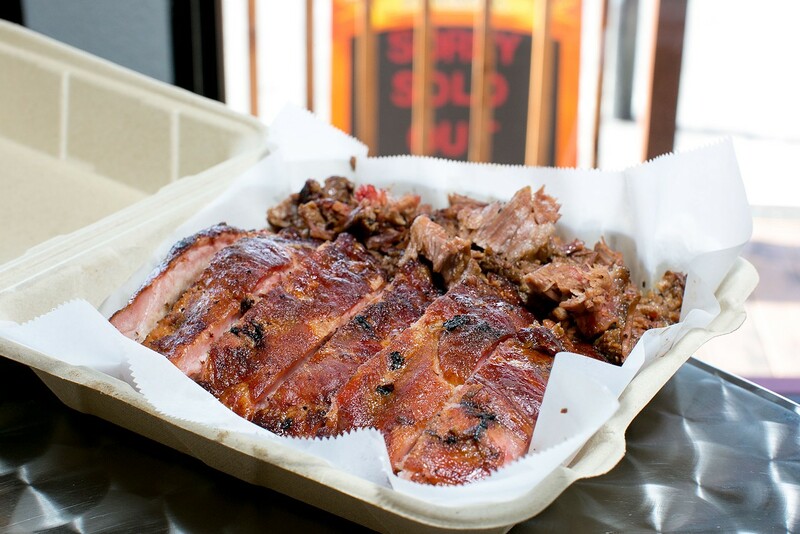 BBQ Hut serves baby backs, rather than the fattier St. Louis-cut ribs or whole spare ribs that are favored by most of the Bay Area's well-regarded barbecue restaurants. Baby backs, on the other hand, are a cut whose reputation was perhaps forever tarnished by the long-running Chili's jingle ("I want my baby back, baby back ribs") and the chain's lackluster version of the dish. But Moffett said he prefers baby backs because they're meatier and do a better job of absorbing the flavor of the dry rub. And his ribs made for a persuasive argument: They were as thick and meaty as promised, and tender without the falling-apart texture that usually indicates barbecue has been overcooked. All around the edges was a pink smoke ring, maybe a half-centimeter thick, that was as pretty as any you'll see in the pages of a glossy food magazine. Most important, though, was the taste, which featured no complicated spices, just the perfect union of smoke, salt, and pork — flavorful enough that you likely won't even think about reaching for the sauce. At $32 for a full rack, these are some of the most expensive ribs in town. But they're worth it: These are ribs that you eat meditatively, with great thanksgiving. When it comes to the specific details of his barbecue technique, Moffett mostly subscribes to the secret-recipe school of cooking, declining to reveal basic details about the dry rub or the kind of wood he puts in his smoker (though he did say he uses a different wood for chicken than he does for red meats). Moffett's sweet, tomato-based barbecue sauce (available in both "mild" and chili-flake-laced "spicy") is made with fruit juices and an array of unnamed "seasonings." He buys his hot links from an unspecified local butcher. In any case, each of the restaurant's smoked meats are notable in their own right, and if you bring a friend or two, the $40 "Big Hut" combo, which comes with four sides and generous portions of all four meats, is a good way to sample the menu. While those links aren't house-made, Moffett does smoke them, very skillfully, on site, so that there's a wonderful crunch when you bite through the snappy casing. Surprisingly, I liked the moist, fatty mild links even better than the slightly drier, paprika-heavy hot links, which reminded me of Mexican chorizo. And while I wished the chicken was a touch smokier and more boldly seasoned, both white and dark pieces were cooked perfectly — about as tender as you'll ever find in a barbecue restaurant. But BBQ Hut's most popular item is probably the brisket. I've yet to meet a serious barbecue practitioner who says she does anything other than cook her brisket in the smoker "low and slow," but even so, Moffett falls on the extreme end of that spectrum, smoking his for eighteen hours. It's ostensibly a Texas-style brisket — served with sauce on the side, and seasoned with a dry rub that consists of just black pepper and kosher salt. 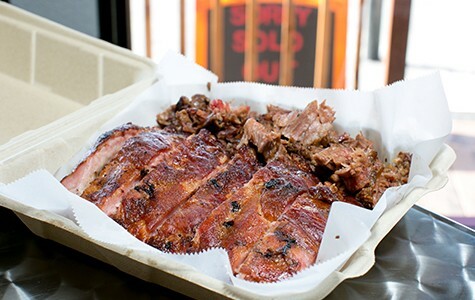 BBQ Hut diverges from conventional wisdom by chopping up the brisket instead of serving it sliced — an approach, Moffett argued, that makes for wonderful makeshift sandwiches when you scoop the meat, with barbecue sauce, onto the plain sliced bread that comes with each combo plate. If you buy a whole brisket, Moffett will cut it into slices if that's your preference — but try it his way first, he insisted: "I've never had any complaints." 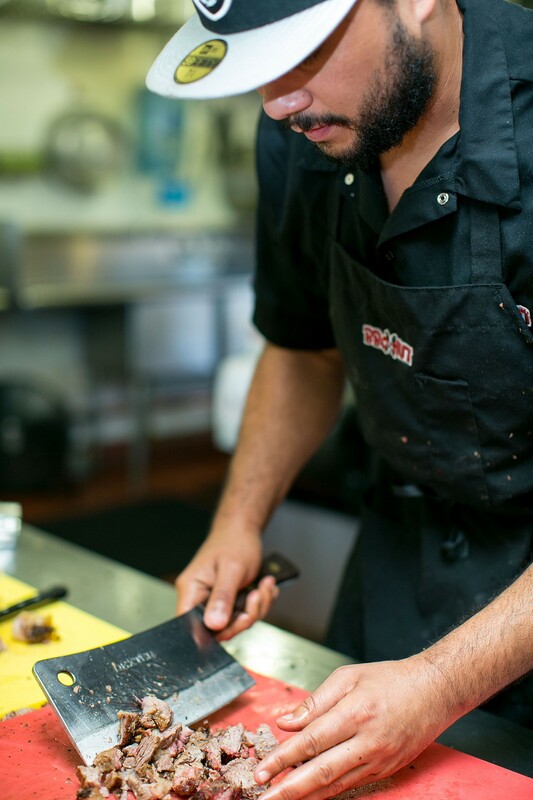 Like any self-respecting barbecue master, Moffett believes the 'cue he's serving is second to none. When it comes to the East Bay, he just might be right. I might have a slight personal preference for the brisket at B-Side or the smoked chicken at Slow Hand out in Pleasant Hill. But consistency being the hobgoblin of both little minds and barbecue pitmasters, I've encountered duds at all of those restaurants. Meanwhile, my visits to BBQ Hut have yet to yield a piece of meat that hadn't been smoked and seasoned with a skillful hand, and cooked, if not to the perfect level of doneness, then pretty close to it. Moffett told me he'll be offering another Southern specialty — smoked whole turkeys — for Thanksgiving. If my experiences at the restaurant so far hold true, there's a good chance they'll be worth checking out.